In May of 2015 I traveled to NYC for my first BookCon, and what an experience it was – completely overwhelming, but wonderful as well. My favorite part of the experience, was a panel with Marie Lu, Sabaa Tahir and Renee Ahdieh and I told myself I would read all of their books! I started with Marie Lu’s Young Elites series, and when I found out she would be coming to the bookstore I work at in September, I figured I should read Legend as well! Marie Lu is a fabulous writer. And while not my personal favorite (Sarah J. Maas is), she is my favorite author to share with others. I love recommending her books to people because she has such wide appeal. Boys, girls, lovers of fantasy, science fiction, survival fiction (a la The Hunger Games), there is something in her books for everyone. Her writing is accessible to middle grade through adult readers. As a former middle school teacher, I understand the struggle that arises when trying to find books for 12 year olds that are challenging enough, but also appropriate to their maturity level. Marie Lu is one of very few authors that write about older teenagers in a way that doesn’t make parents of middle schoolers cringe. 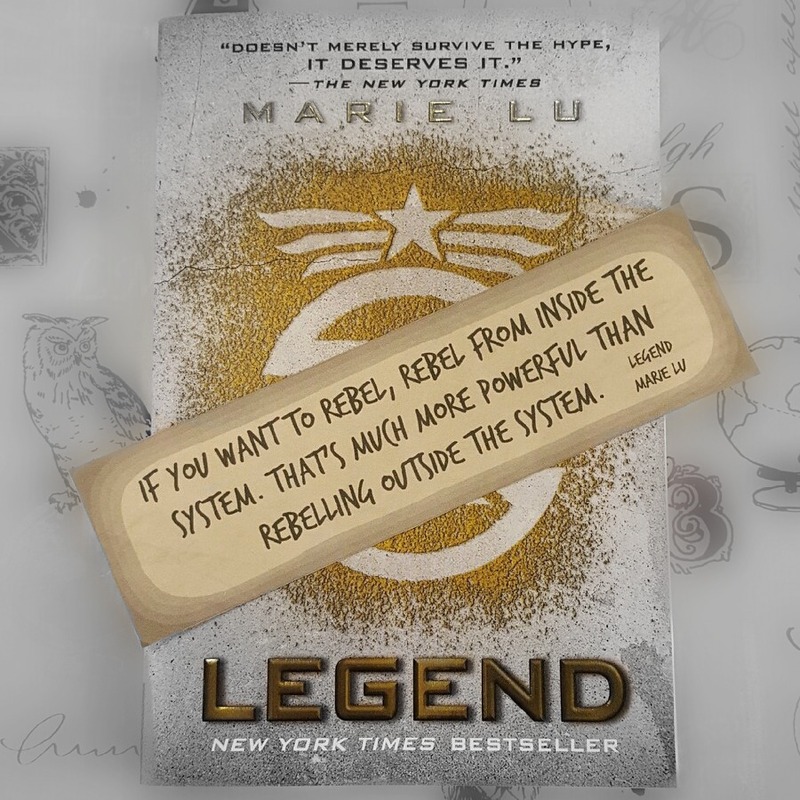 In regards to Legend, I love how Marie Lu portrays her characters – June as a rule following member of the military, and Day as a kind-hearted fugitive. As their paths intersect, they both grow and evolve as characters, given the effect that each has on the other’s sense of responsibility and loyalty. Told in alternating perspective chapters, readers get to know both June and Day equally well and both are so intriguing that the balance is near perfect – you don’t want to skip either character’s chapters to get to the other’s. I have been asked by customers at the store if Legend is too much like The Hunger Games or Divergent and while I mention that they are considered to be part off the same dystopian genre, there is a uniqueness to the diversity of characters that Marie Lu includes, as well as the story telling – in my opinion, she is a better writer than the authors of The Hunger Games and Divergent and therefore a better selection for young readers and budding writers.